The Labor Market Information (LMI) Division collects, analyzes and prepares a wide array of labor market data including: employment, industry and occupational statistics, wages, projections, trends and other workforce characteristics. Additional current and historical labor force information, along with data files for the above summary, are available on the Unemployment Rate & Labor Force (LAUS) page. Iowa’s seasonally adjusted unemployment rate remained at 2.4 percent in March. The state’s jobless rate was 2.7 percent one year ago. The U.S. unemployment rate remained at 3.8 percent in March. The purpose of the Laborshed analysis is to measure the availability and characteristics of workers within the State of Iowa. The information reported is collected through Iowa Workforce Development’s household Laborshed Survey which is conducted throughout the year. The communities of the Amanas, Cedar Rapids, Iowa City, Monticello, Tipton, Vinton, and Washington have had a Laborshed study completed. The results can be found on the LMI Laborshed page (www.iowalmi.gov/laborshed). 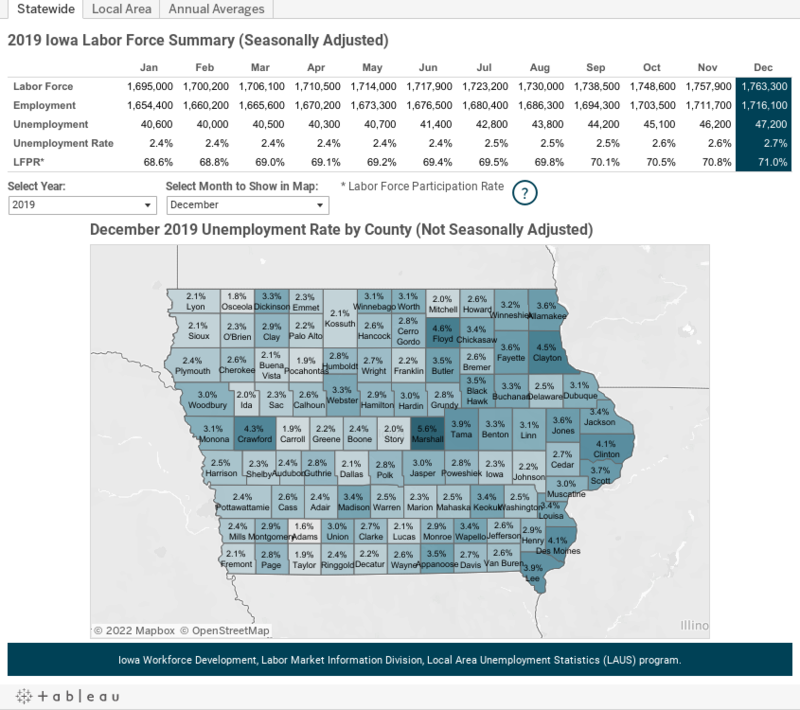 Iowa’s seasonally adjusted unemployment rate remained at 2.4 percent in February. The state’s jobless rate was 2.7 percent one year ago. The U.S. unemployment rate dropped to 3.8 percent in February.